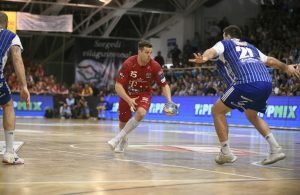 Roland Mikler showed tremendeous performance at SAP Arena, where host Rhein Neckar Lowen weren’t able to suffer third defeat in a row in seven days. Telekom Veszprem goalkeeper had 22 saves in important win of his team 29:25 (14:13). This is the second win in a row of Hungarian vice-champions at VELUX EHF Champions League. Now, Veszprem are again in the race for TOP 4 teams at the end of Preliminary Round. ← Previous Story NBSC WORLD HANDBALL GOALKEEPER 2018?